Eustace, K. (2003). Making research work for you: Responsibilities and pitfalls. Bulletin of Applied Computing and Information Technology, 1(1). A large number of postgraduates in the computing disciplines in Australia and New Zealand are full-time teaching staff in universities and colleges. The completion rate can be slow, as many face competing priorities at work and at home, so any way that student progress can be effectively improved is a bonus for the postgraduate, the institution and others around them. This paper discusses aspects of postgraduate research, such as the responsibilities and pitfalls encountered by the author during the development of his own PhD, using action research and ethnography in a longitudinal study of an online learning community. It is hoped that this paper, may help other postgraduates with their research journey, by reflecting upon ways to make research work better for them and realising the responsibilities needed in avoiding the pitfalls which delay successful completion of a thesis or professional doctorate. This paper is a structured narrative of my experiences as an academic combining full time teaching with research for a PhD since 1998. Doing postgraduate research in computing and information technology fields connects amazingly to the concepts and processes of the 'things we do', namely object-oriented methods and project management. The nature and direction of research and its components are discussed; some examples of implementing proper project management of the thesis are given, and the issue of making research work for the reader is elaborated upon. Research does not follow a single template, is a personal process and evolves with each iteration and step along the road to completion. It is a hope that some of my documented experience and methods will be of benefit to other students and supervisors. Computing research is a relatively new field of research, which calls upon the research methodologies developed in other areas like social science and education. Developments in the use of information systems research methods by Professor Michael D. Myers (Myers, 2003a; 2003b) in New Zealand and Professor Ron Weber in Australia (Weber, 1999; 1994) and the Association for Information Systems at http://www.aisnet.org/, are a good starting point for examining information systems research methods. They are also useful to other areas of overlap such as information technology, networking, computer science and software engineering projects. Working closely with your supervisor, you cut your own path through a dense forest and at times feel quite alone with out realizing that you are not far from anywhere. For research into professional practice, an action research model is useful, as discussed later. A lot of research methods are said to be from the social sciences rather than the hypothesis testing of scientific methods. So now it gets very hard to decide which way to turn. In IT we can build our research methods by looking both inwards and outwards at the 'things we do'. This is where the review of the literature is handy to move you towards focusing and developing some key questions and a problem. The project data form (Figure 1) is used to develop a project proposal plan to present to your supervisors and colleagues. If your study involves human participants, it is vital when planning the methodology that you conform to the ethical guidelines for that research. All dissertation proposals are screened for ethical approval prior to acceptance; although as a research thesis student you should have at least considered these issues before writing and submitting the proposal. A well considered proposal plan (Figure 2) is likely to win you praise from your supervisors. The ethical guidelines are a big help in finalising the research design, methodology, instruments used to collect the data and how it will be processed, communicated and stored. Forward schedule: start the activities on a given date and carry them forward to the finish date. Backward schedule: look at the date when the thesis is due and work out the logic and start dates of activities backwards. C: essay on research methods. Figure 3. Example of bad multi-tasking. Assume each task took 10 days. If you do them in sequence, then the lead-time from start to finish is about 30 days. If each of these tasks was broken into 2 smaller units of work, by doing half of each before returning later to finish off each second half, then the effect of such "multi-tasking" is to make each project LONGER than they needed to be. 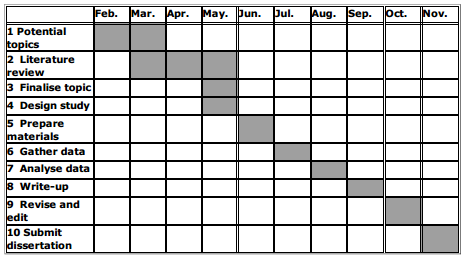 The time constraints are the START and FINISH dates for each activity. This can be entered into a Microsoft Project plan or on paper using an * for each week. Let me assume that you start on Monday 02 February, 2004 and finish on Monday 08 November. [You will learn to like "Mondays" for your project milestones]. That means that your thesis year is about 39 weeks long; for a PhD, multiply by 3 (Table 2 and Table 3). The plan is revised and running well by the start of 'June' (the metaphorical halfway point) and has changed shape due to the impact of the research methodology and the choice of quantitative and qualitative tools. The use of a questionnaire in my example, could readily be substituted by a range of information systems research methods, such the use of interviews, case study method, field work, ethnographic techniques etc. The revised plan is likely to reveal how a bottleneck brings back potential for 'bad multi-tasking' during 'September' (the 75% stage of the thesis). Write-up, revision and edit, as well as the submission, are kept clear and on track, as you work to the finish line with your supervisors (Table 4 and Table 5). combining the suspense format and the journalist pyramid form of writing. The sentences should be simple, short and sharp as simplified prose is better and is always clearly thought out. You need to begin writing the day you begin your thesis. Reading out aloud is a good way to refine your thoughts and helps to build your associative memory skills. There is often an early inertia as feelings about lacking knowledge can stop you from starting to write, so consider the following advice: "You don't know what you don't know until you start writing"
In tabulated summary the linkages can be made vertically and horizontally in Table 6. Robertson (1999) suggests that thesis writing must provide a well structured and up-to-date review of the literature. This section examines the why? what? and how? of writing a critical literature review. 8.1 Why Do a Literature Review? You are writing for the project, for yourself and for your examiner(s). For the project under investigation, a critical literature review helps to find evidence for the need for the project or investigation such as filling a major gap in knowledge. Since the literature review is a continuous process, it does require a disciplined organization and helps the writer to track resources and to read critically, discover methodologies and to build a research design . Finally, the examiner looks for your professional competence in the topic area in both depth and breadth. It is important to use the literature review to build the theoretical and practical frameworks or context for the study. 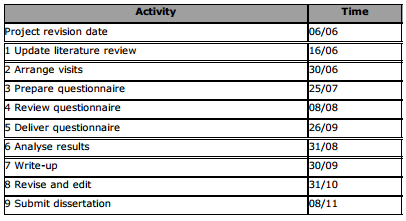 The examiner has to be convinced that the project is justified (Table 7). 8.2 What's in a Literature Review? Sometimes a gap appears in the literature. That gap may contain your research agenda and point you in the right direction, so do not ignore the worth of the literature review. 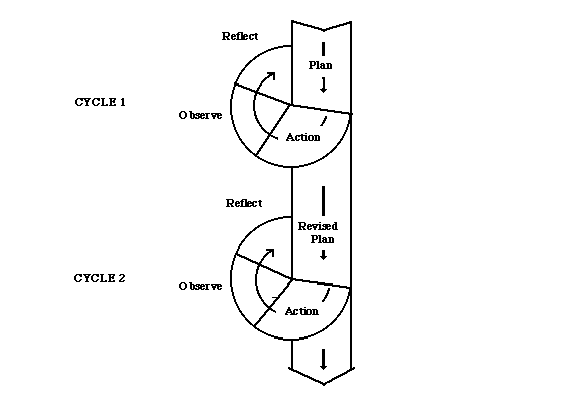 The researcher's 'hour-glass' model (Figure 4.) is useful in helping to see the process and functions, together with its connections to other stages in the development of your thesis, that the review of the literature helps to reveal. 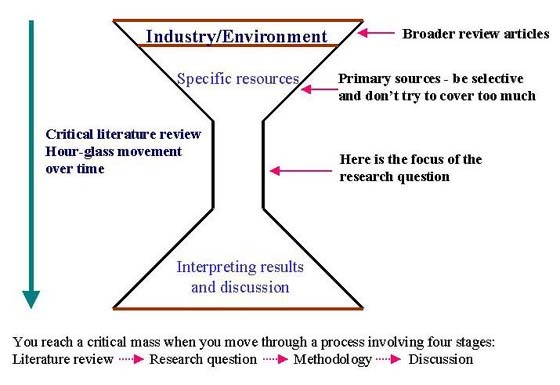 Overall the literature review has an hour-glass shape. At the top it begins with broad context literature that shows where the research fits into the industry, discipline on environmental context. Then it narrows or spirals down to primary literature relevant to the problem itself. This stage also exposes knowledge deficiencies and justifies your research. At this stage you must exhibit a grasp of the significant literature and knowledge gaps which your thesis will address. Your research project takes place at the narrow waist of the hour-glass after which the story 'widens out' again showing the results, interpretation, discussion and conclusion. At this stage you should return to the 'big' question. Keep the literature review short and show only major and significant references. Fifty pages of references are too much! Start with the broad literature on your topic - there is no need for primary critical literature - but you get down to your 'big question' about a specific topic. Then you need to go on to the seminal and primary literature to establish the knowledge gaps, where you will work. Learn to work the gaps. 8.3 What is Primary Literature? This is often asked and the immediate answer that is often used includes peer reviewed articles, however the theses of other students before you, are also quite valuable. 8.4 What Does the Literature Do? It describes, summarizes, evaluates, clarifies, integrates, synthesizes, informs and targets - i.e. takes the reader somewhere on their thesis journey. Be aware that the literature does not list, regurgitate, confuse or ramble. 8.5 How Does I Do All This? Sources include your supervisors, library, Internet (Web sites, chat groups (e-mail, newsgroups and Web bulletin boards), experts, conferences and workshops (like the one that spawned this paper!). At this stage, you must realize that the supervisors are reaching their 'used-by dates', because in most fields, the literature is so vast, for example, agriculture or the agenda is volatile and changing rapidly e.g. information technology research. The supervisor's most useful role is in quality control - for example, to help you to throw away a lot of irrelevant literature and to introduce you to the experts in the field. A good idea is to take your supervisor to conferences so that they can introduce you to the experts, or you should try to find and participate with an e-mail discussion group to filter your references and to develop your methods. focus - is it clear? perspective - is a new reader able to follow? organization - is it clear and logically presented? Make a list of goals and write a topic or mission for your literature review. This will help develop coherence and a sense of where your work is heading. The writing process may be structured. The list below shows one way this can be done. Obtain feedback from your supervisor at this stage, to make sure you are on the right track. A search of Web sites from Australian universities which offer an honours thesis program in information technology, revealed some common problems and pitfalls in the research process, for students working in computing and information systems research areas. the student experiences difficulties which are not addressed early enough. Organisations like New Zealand's National Advisory Committee on Computing Qualifications (NACCQ) and the Australian Computer Society (ACS) desire those who are involved in teaching computing courses to stress that the information and communications technology (ICT) profession is a 'people-oriented' profession, not just 'technically-oriented'. In trying to determine the tasks of research, a checklist is handy for both students and supervisors, in helping to identify a topic or area of interest, as well as the responsibilities. ensuring that language, writing style and presentation of submitted work satisfies the institution's requirements. 12. How Do You Find Time to Do Research? Revise the priorities in your time management plan to eliminate the 'time bandits' in your life. I started to work on research on weekends, but I knew that was not enough. 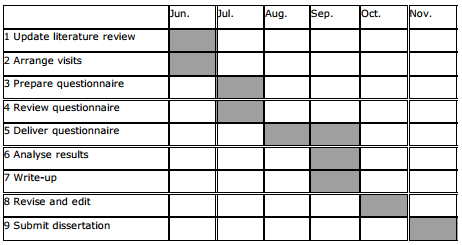 The university or college may have some time release plans such as marking assistance or study leave, - so asked. In my case, I took some funding for time release from marking and some research (but the money ran out). Then a special committee gave me some study leave. However you find the extra time to do your research, the return on investment (ROI) for the institution and your professional development is very sound. Professor Frank Vanclay once told me: 'be prepared to invest in your own research as the return on your investment is very good'. I knew I had to devise 'working smarter' strategies, methods and efficiencies in order to help make research 'work for me'. Here are some ideas I had. The first idea I had was not original but powerful. It was make my teaching my research and vice versa. I made the boundaries fuzzy and called it a learning journey. NACCQ, ACS and other organizations (for example , Australasian Society for Computers in Learning in Tertiary Education- ASCILITE) flourish by riding and nurturing the wave of research into the professional practice of the ICT profession. In my case, that fuzzy approach was through the use of ICT in education (Eustace, 1998). So take your research domain such as networking, e-commerce, spatial information technology or computer ethics and security and connect it closely to your own professional practice, now and in the future. You can start to blur the edges of your teaching and research by looking at the way research is done in other professions. In education and health, for example, much research is targeted at moving the profession forward, by use of the action research method, where you examine your own professional practice. Action researching your own professional practice as a lecturer, brings together the Gemini twins of teaching and research. One useful action research approach is to take a learning journey and take a closer look at yourself by starting to plan, act, observe, reflect, on your own practice, as both teacher and researcher. 13.4 Hybrid Methods - Is That Smarter? allows for replication of results in different problem domains. generalisation and reliability for your results. the situations in which the practices are carried out. finding worthwhile, efficient research methods for data collection and analysis. I hope that paper helps research work for you by greater acceptance of the responsibilities, by reading widely what others have done and in doing so, avoiding the many pitfalls, with your supervisors to guide you along the road to completion. Brown, R. (1995). 'The "big picture" about managing the writing process', in Quality in Postgraduate Education - Issues and Processes, ed. O. Zuber-Skerritt, Kogan Page, Sydney. Eustace, K. (1998). Ethnographic study of a virtual learning community. Internet Research: Electronic Networking Applications and Policy. 1998. Vol. 8 Number 1, 83-84. Robinson, A. (1999). Critical literature review. Thesis Writing Workshop. 13-14 March 1999. Centre for Professional Development, Charles Sturt University, Bathurst. Kemmis, S. & McTaggart, R. (Eds) (1990). The Action Research Reader 3rd edition Deakin Uni Press Victoria. Weber, R. (1999). PhD Supervision: A Student-Centred Focus. Presented to Proceedings of the Australian Council of Professors and Heads of Information Systems, September 1999. Weber, R. (1994). Research Methods in Information Systems: Observations and a Personal View. Presented to Griffith University Research Workshop in Computer Science and Information Systems, June 1994. Copyright © 2003 Eustace, K.